Have you tried HINT water yet? It is a delicious alternative to sugary drinks when you want a “step up” from plain water. 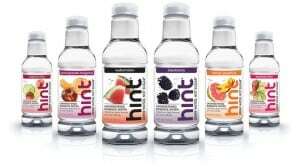 I have enjoyed HINT water for over a year and especially love the HINT Blackberry essence…it is like a burst of fresh blackberries. There are lots of HINT flavors to choose from so I decided to try some new flavors. The Pomegranate Tangerine was my favorite of all the new flavors including lime, pear and the uniquely and tasty honeydew-hibiscus. HINT water’s concept is simple yet brilliant, “Pure water with just a hint of pure natural essence.” I like that HINT water is a healthy beverage option for my children instead of all of the other sugary choices. Added bonus…..? My kids really like it and I know that it is good for them too. We recently took a few bottles in our backpack when we went for an afternoon bike ride and enjoyed HINT water when we were finished. It was very refreshing and the perfect way to quench our thirst and end our bike ride. To find a store near you that carries HINT water head over the HINT store locator.